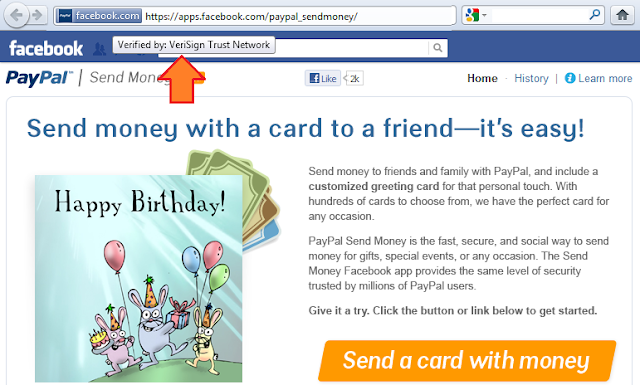 Home Facebook Tips How to Money HOW TO: Send A Gift via Facebook with PayPal. HOW TO: Send A Gift via Facebook with PayPal. Facebook and PayPal have joined their hands to make a latest application called Send Money that let people move money by electronic means to any of their Facebook acquaintances or friends. Send Money application, is just as uncomplicated as its name. You have the option to send either an e-card with money or only money without card. You select a card, select a friend and then decide on how much money to send. It allows you to send money to anybody on your friends list, with the standard listing of terms and conditions. Send Money is the first application to facilitate peer-to-peer (P2P) payments using Facebook and PayPal. And as it is a P2P transaction, there are no transaction charges, although PayPal’s usual limits and international charges are still applicable. After signing in your Facebook account and approving the application, you’ll be able to employ PayPal to move funds to persons that you’re linked with on your Facebook account. It is necessary that you and your friend to whom you are transferring the money should have PayPal account. If you don’t have a PayPal account, all you need is an email address to open one. You will get easy sign-up instructions along with your money notification from PayPal. It provides a cover of safety measures against disreputably fraudulent online payment services. A payment is to send and obtained without any charge, given that transfer is funded using a bank account with both parties in the United States. If you are using a debit or credit card PayPal will charge 2.9 % from either the sender or receiver, along with a 30-cent processing fee as well. And if you’re transferring funds overseas, fees range from 0.5% to 3.9%, depending on various things. The Send Money application, to a degree is intended to be a safe and suitable means to send birthday or anniversary or holiday gifts. It provides people with the choice of including a card along with the money. The cards can be modified with a message, or a picture or a video. It’s not necessary that money is always sent for celebratory reasons. So people can decide not to send a card if that appear more suitable. You can use Send money app to transfer money to friends and family with PayPal, and include a customized greeting card for providing personal touch. With hundreds of cards to opt from, you can have the ideal card for any event. This is a guest post by Alia Haley who is a blogger by profession. She loves writing on technology and luxury. Beside this she is also fond of gadgets and recently an article on Sony NEX-C3 attracted her attention. These days she is also busy in writing an article on wooden headsets and Digital Photo Frame.